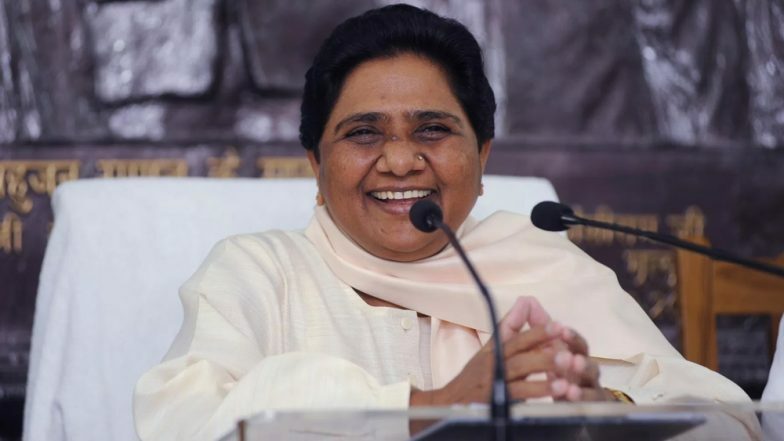 Lucknow, April 14: The Bahujan Samaj Party (BSP) on Sunday released the fourth list of 16 candidates for the Lok Sabha Elections 2019. The party has given a ticket to Chandrabhadra Singh from Sultanpur parliamentary constituency against Bharatiya Janata Party (BJP) candidate Maneka Gandhi. The BSP has fielded Ashok Kumar Tripathi from Pratapgarh, Ritesh Pandey from Ambedkarnagar, Ramshiromani Verma from Shravasti and Aftab Alam from Dumriyaganj. Uttar Pradesh Lok Sabha Elections 2019 Schedule: Constituency Wise Dates Of Voting And Results For UP General Elections. The others candidates who are contesting on BSP tickets include –Atul Roy from Ghosi, Sangeeta from Lal Ganj, Binod Kumar Jaiswal from Deoria and Shyam Singh Yadav from Jaunpur. The Mayawati-led BSP, which failed to win a single seat in 2014 Lok Sabha elections, is contesting the 2019 parliamentary polls in alliance with the Akhilesh Yadav-led Samajwadi Party (SP) and the Ajit Singh-led Rashtriya Lok Dal (RLD). Uttar Pradesh Lok Sabha Elections 2019: Phase I Polling Concludes, Over 64 Percent Voters Exercise Franchise. The BSP is contesting on 38 seats, the SP has fielded its candidates on 37 seats and three seats are left for the RLD. The SP-BSP-RLD alliance has left two seats of Amethi and Rae Bareli for the Congress in the state. Meanwhile, the BJP-led NDA had won 73 seats from Uttar Pradesh in 2014. Lok Sabha Elections 2019 Schedule: Voting In 7 Phases From April 11 to May 19, Counting And Results On May 23; Check All Dates For General Elections. In March, the Election Commission of India (ECI) had announced dates for Lok Sabha elections in Uttar Pradesh. The seven-phased Lok Sabha polls are scheduled from April 11 to May 19. The polls in the state will be held in seven phases on April 11, April 18, April 23, April 29, May 6, May 12, May 19. Eight Lok Sabha constituencies- Saharanpur, Bijnaur, Muzaffarnagar, Ghaziabad, Baghpat, Noida, Kairana and Meerut went for polls in the first phase.